Next, we would like to thank BioWare for giving us the opportunity to conduct this contest and for making such an amazing game! Finally, we would like to thank Razer for making such terrific products and for donating a few for us to give away! 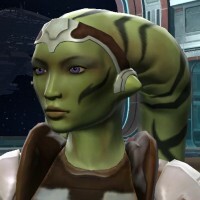 Dragging a forearm across her forehead to keep the sweat from her emerald eyes, the young Jedi Consular crouched behind what was left of a stone pillar, using the short lull in the battle to draw a much needed breath. The fighting had been non stop since the Sith had attacked, capturing the Senate building and destroying the Jedi Temple, but she had no time to dwell on that as the fine hairs at the nape of her neck rose again in warning. Drawing on the Force, she entered a deadly calm and feinted left, her lightsaber humming into existence as she dropped fluidly to the ground and rolled. Deftly coming to her feet, she faced her next assault. The soldiers fired rapidly as they advanced, leaving the exhausted Jedi hard pressed to deflect their blasts. She found herself pressed back towards the ruined building she had used for cover only moments before, her feet somehow picking their way unerringly through the rubble. Never one to like the odds stacked against her and even less so with her back against a wall, she unleashed a Force-wave that sent one of the attackers flying through the air, landing dazed against the pavement. Using the Force to guide her, she continued to deflect the blasts of the second attacker, allowing him to close the distance before pivoting suddenly on her heel, her blade slicing through his heavy armor to cleave through the flesh below. Her gaze rose towards the other man just in time to see him scrambling away before shifting to focus on a building only a block away. Davron Mickal’s head snapped up as the door slid open, his hand unconsciously going to his…empty holster. Bracing himself in expectation of another attack, he once again faced the door and felt an instant of relief as he saw the Jedi Knight warily slip through. That relief was soon replaced by shock as she moved closer. She was, quite literally, a mess. Her delicate features were obscured by a layer of grime, an obvious testament to the situation outside. Her hair which had at one time been intricately braided and wrapped, coronet fashion, around her head, had begun to unravel, leaving pale copper curls plastered to her face, the rivulets of sweat allowing him to glimpse a hint of her pale skin. Davron winced slightly as she snapped off her lightsaber and stood motionless just inside the door. He must have shifted, and her eyes caught his in a piercing glance. Security Officer Eleen’aven: [Enters room with a handful of flimsiplast, sits down at table across from Corellian male in for questioning]…Draeks? Draeks: [Leans back in chair and props feet up on table] Captain. Eleena: [Looks up from what she was writing] …Sorry? Draeks: Captain Draeks. I have a ship, you know. Eleena: Right. Captain Draeks. [Continues to read off the identicard] Age… 28. Draeks: It’s a very nice ship. You should see it some time. Eleena: [Ignores him and continues reading] Male… Cyborg. Draeks: I can assure you, all the parts are fully-functioning. Eleena: [Sighs] Your ID says you’re Corellian-born. What brings you to Ord Mantell? Draeks: Well, that depends on what I’m being charged with, here. Draeks: Oh, fine. I was delivering a perfectly legal shipment of self-defense mechanisms to a group of concerned citizens. Draeks: [Defensively] It’s legal! I was merely lending aid to the supporters of the Republic here on your fine planet. Eleena: But you’re not Republic military. Draeks: [Pouting] Not for lack of trying. I was on Coruscant on my 18th birthday, ready to enlist. As luck would have it, that’s when the Sith attacked and sacked the planet. I was under pretty heavy fire when I realized military wasn’t my thing. I have quite the collection of souvenirs to prove it. Want to see them? Eleena: The sacking of Coruscant was ten years ago. That’s a lot of time to cover. Draeks: You want the short version or the long version? Eleena: Force save me. Short, please. 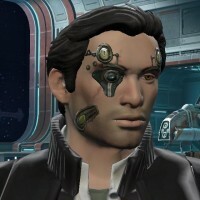 Draeks: Well, I “borrowed” a Mark VI Imperial Interceptor once the Treaty was signed, and I headed back to Corellia. Bought myself a ship and got my face fixed up. Been running a courier service with that ship ever since. Eleena: Dare I ask what the long version would have entailed? Draeks: Much more emphasis on my heroics and continued mention of my suave nature and roguish good looks. And further insistence that you see my battle scars. Because that’s what I meant when I said ‘souvenirs’. It’s called a metaphor. Eleena: [Sighs, shuffles stack of flimsi] Looks like your ID and story check out. Since we found nothing illegal in your possession, you’re free to go. Draeks: [Leans across table, places hand on top of flimsi] Since you seemed so interested in me, how about I buy you a drink and we talk some more? Eleena: Interested in you? I’m a security officer. You’re a scoundrel. See the connection? Draeks: You sure? Could have sworn you wanted to get to know me better… say, off the record? Congratulations to everyone, and great work! Especially nice to see the video and graphic design work there, too! Thank you so much for hosting this contest — I had a hell of a great time working on my entry. Thanks to CRR for this opportunity to delve deeper into the ToR experience. I’ve had a blast developing a story for my contest entry and even though I didn’t win, I liked the challenge and I think the hours I put in meeting it were time well-spent. Only one question, though: was there really nobody outside the US worthy of any prize? And, before you bash me, I’ve had several non-US-based friends submit really good entries. Subjective POV, I know. That being said, I enjoyed reading the winners’ entries. Congrats to them. That’s the great part of judging the contest, we didn’t know where anyone was from! We let the entry stand on it’s own. It wasn’t until we picked the winners and had them send us their addresses that we noticed everyone picked was from the US. Thank you for participating and making our week! We had the best time reading/watching/listening to all the entries. We have some very talented listeners! Grats to the winners! Creative and very entertaining!